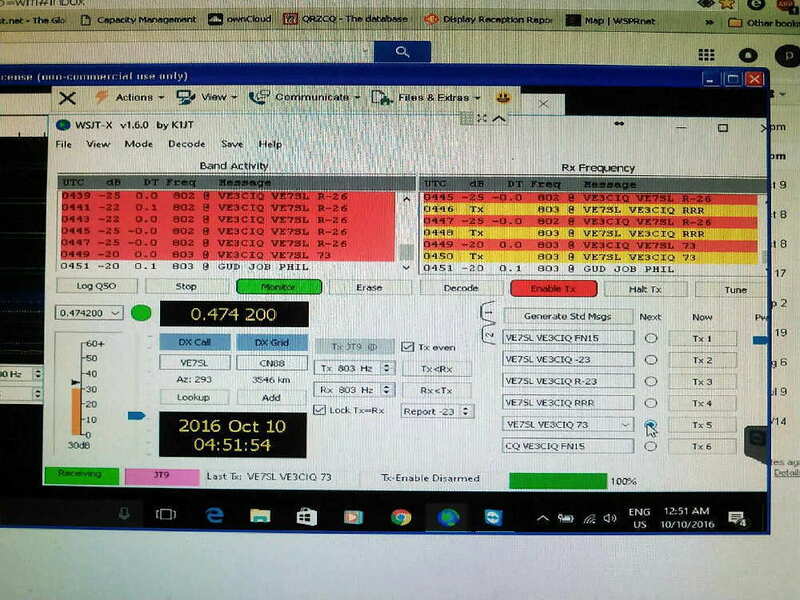 November's 630m Activity / CW Crossband Night! 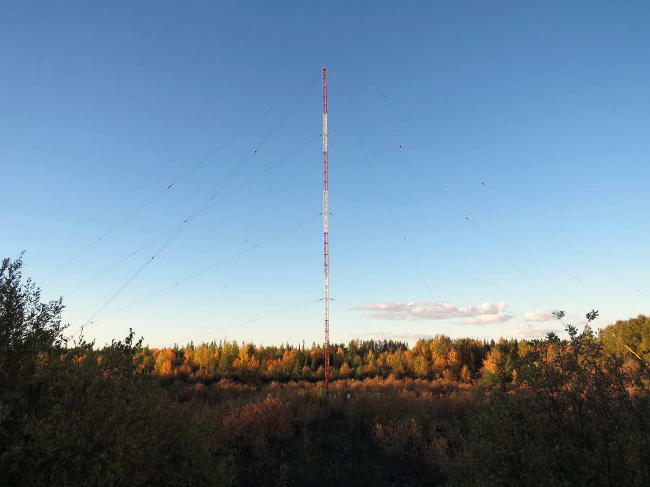 Once again the 630m band will become a cacophony of CW and other sounds on Saturday night, November 12th! The actual motivation for the weekend event is a celebration of the November, 1906, Berlin Treaty ... making 500 kHz the International Distress Frequency for the next eighty years. It's also a great excuse for a lot of 630m diehards to get on the air and celebrate the band. 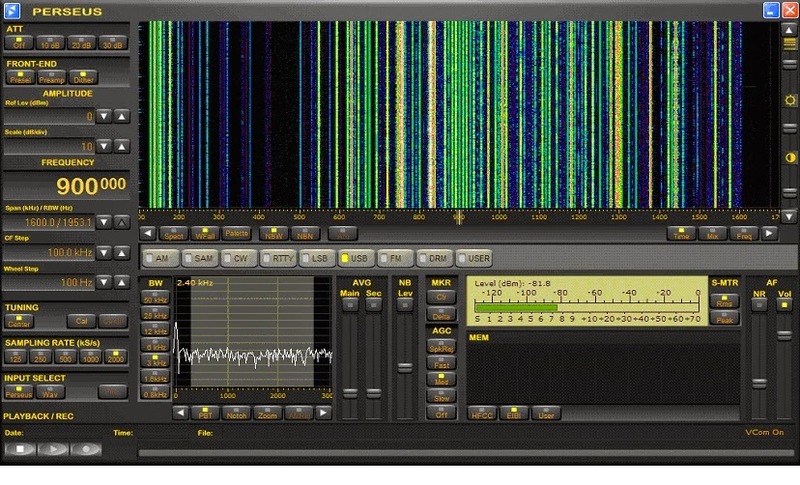 U.S. Part-5 Experimental Operators including WD2XSH stations and others will operate in the 472 – 479 kHz band. They will use CW transmissions for QSOs and beacons with special messages. There may also be some operation on 500 kHz itself. 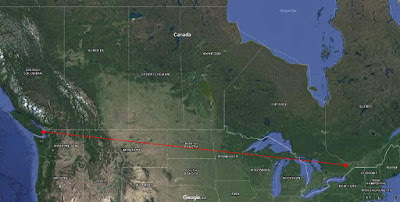 Canadian Amateurs will be concentrating their efforts on providing two-way cross-band CW QSO's with other amateurs in the U.S.A. and Canada. They will be transmitting on specified frequencies (see below) and listening for replies to their 'CQ' on specified QSX frequencies within the 160, 80 and 40m CW bands. The Maritime Radio Historical Society will activate its KSM/KPH transmitter at Bolinas, CA for a mini “Night of Nights” with special messages and bulletins. Listeners are encouraged to send their reception reports to individual stations or via the LF/MF ON4KST chat page which should be very active during the event. Most experimental calls can be found via QRZ.com listings. All amateurs are encouraged to participate in the cross-band activity by being able to listen on 630m but being able to answer on one of the specified HF bands. So far this fall, propagation on the 630m band has been excellent and hopefully will continue well into November. 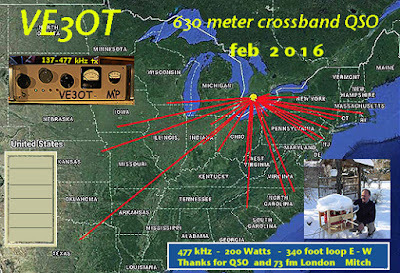 Previous cross-band events have seen contacts made from coast-to-coast as well as west to Hawaii. Several US Experimental stations also will be in operation throughout the band, in two-way QSO mode with each other, using CW or JT9. 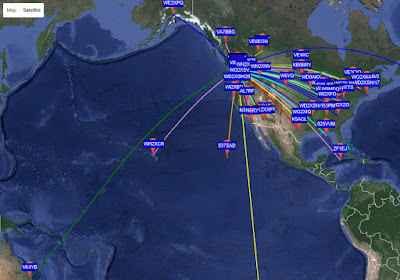 Some stations will also use WSPR and QRSS CW beacon modes. The success of this event largely depends upon the participation of as many amateurs as possible. Hopefully you will be able to participate in the two-way cross-band activity by being able to listen on 630m and then able to switch over to HF to transmit. This could involve the use of a separate receiver / transmitter or can often be easily implemented via your transceiver's 'A/B' switch. No antenna for receiving on 630m? Don't let that stop you from taking part in the fun. Surprisingly good results can often be had by using a low band wire antenna such as a dipole or inverted-L for listening on 630m ... the antenna does not necessarily need to be resonant. In fact, often times, a non-resonant receiving antenna can provide a better overall S/N ratio than one which is resonant, as these often gather more noise along with signals. I'll be sending out a few more reminders as the 630m activity night gets closer but please mark your calendars and make a date to participate, by either sending in your 'heard' reports or by getting on-the-air and working some of the Canadian cross-banders. If you have further questions, please contact myself or John Langridge, KB5NJD / WG2XIQ. Another NDB CLE challenge is in store this coming weekend with CLE 212. This time the frequency range is 270 - 319.9 kHz bringing it into the DGPS band, although these signals should not be reported. A good target for this range is 25W YPM in Pikangikum, Ontario, transmitting on 274 kHz. It is widely reported throughout North America, thanks to its large antenna system, pictured here. Look for it on 274.361 kHz with your receiver in 'CW' mode. Remember that most Canadian NDBs use a ~ 400Hz tone for modulation while the U.S. ones are usually ~1020Hz on both sidebands. and not in an attachment, with 'CLE212' at the start of its title. Many of us in Europe will be changing our house clocks this weekend. Monday at LOCAL midday we may win an extra hour's listening! If you send any interim logs, please also send a Final (complete) one. 2nd November. I am hoping to make all the combined results on that day. Research indicates that new brain cells are grown whenever you learn a new process or study new material. If that's the case, I've a head-full of new cells this week after deciding to set-up a Twitter account for the first time. Setting up the account and trying to learn the ins and outs of tweets, hash tags, re-tweets, who sees what and who doesn't ... all without trying to mess things up too badly, has been fun. Although I haven't figured everything out with confidence, I'm far enough along to get going ... I think! The link to my Twitter account is here and I will add a specific link on my blog page, at the top of the right hand sidebar. Although I try to keep my blog's subject material related to my amateur radio interests and activities, I envision a broader range of subject commentary for Twitter ... not limited to just 'radio' but also some of my other interests and daily observations. As well, I can use it to announce my beaconing schedule and to report any interesting contacts or propagation conditions of note. Although I live on a small island, there is a lot to do here that keeps me busy ... I have many interests and activities, way too many for the number of hours in the day it seems, and some of these will be 'tweet' topic material. In the meantime, I will begin the hunt for other Twitter users with similar interests who I would like to add to my 'follow' list and hopefully begin to build my own list of 'followers' over the months ahead. Although I can make no guarantees, I'll be trying not to end up in the naughty-corner by doing something dumb ... any and all input / advice gladly accepted! My love for radio began at an early age when I first started to tune the shortwave bands at age eleven. Little did I know then, that I was listening near the peak of the strongest solar cycle in recorded history, monster Cycle 19. I thought that what I was hearing was normal for shortwave and that it would always be this way ... and it was, for a number of years. As the solar cycle slowly declined, I began to take a deeper interest in propagation and its relationship with the Sun. After obtaining my licence and getting on the air, the reality set in with the arrival of a rather dismal Cycle 20. Following the vagaries of propagation became almost a hobby in itself, trying to correlate what I was observing with what the Sun was doing and even getting comfortable with predicting what might happen next. 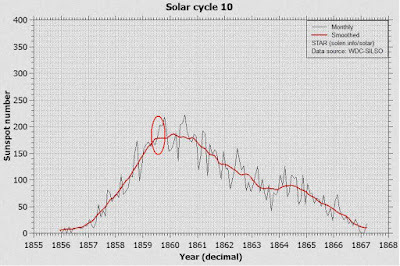 It was particularly exciting during the stronger Cycles (21-23), to watch the dramatic effect of solar radiation on the F layer during the peak winter years of these cycles. With a major interest in 50MHz, watching the solar flux became a daily ritual, along with the fascinating daily rise of the F2 MUF as the Sun peaked over the horizon. On normal mornings, around sunrise, the MUF would typically start close to 28MHz and slowly begin to rise over the next few hours. Often it would slow and settle-in between 38 and 42MHz, stay there for most of the day and then slowly recede as darkness approached. I found myself looking forward to and wishing for more solar flares, along with the solar flux boost that inevitably followed. On these mornings, the MUF would often be at 35MHz or higher, right at sunrise ... and begin climbing. Some days it would shoot-up like a rocket and in a matter of minutes would be at 50MHz or above, bringing thundering signals from the east coast not long after dawn. On other mornings it would climb much more slowly, receding and then advancing again, surging higher and then lower, as it teased its way towards the magicband. It was as if the ionosphere was a living breathing entity, as the solar radiation danced a slow tango with the critical frequency of the moment. Often it would stop at around 48 or 49MHz, stay there for several hours and then collapse ... no 6m excitement that day. A nice bonus of watching this live interaction between the Sun and our ionosphere, was listening to the communications in the range between 28MHz and 50MHz as I followed the rising MUF. This was, and still is to a lesser extent, utilized on FM by paramedics, fire and police services throughout the U.S. It was not uncommon to hear mobile units enroute to an emergency, with sirens blazing in the background. Southern drawls usually meant that any 6m openings would begin in the southern states or the Caribbean, while Boston or New York accents, would herald an opening to New England or the possibility of trans-Atlantic openings to Africa or Europe. I became even more familiar with the daily interaction of the solar wind and how it affected radio ... and found it fascinating. But just as the Sun affects propagation so positively, I was recently soberly reminded of how 'unfriendly' it can be ... as it has been in the past and will be again in the future. An article in this month's 'Astronomy', by Bob Berman, discussed threats to global welfare and in particular, a modern day repeat of the Carrington Event of 1859. 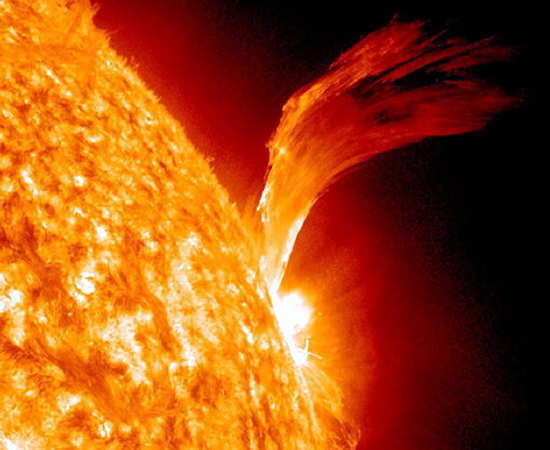 This was a double mega-flare and CME, taking only 19 hours to reach earth, compared to the normal 3-day trip. It was the strongest impact on earth ever recorded and one that will be repeated ... and is almost, statistically 'overdue', unless we dodged it in 2012 when a storm of similar magnitude missed the earth. "What would a Carrington-level event do today, with our ubiquitous power lines, transformers, and more than a thousand operational satellites? In 2008, the U.S. government convened a panel of experts, who concluded that such a storm would completely destroy our electric grid. It would require two to 10 years to repair and cost about $2 trillion. We'd be knocked back to the stone age. That panel panel called Carrington a "low frequency/high consequence" event - the kind humans typically ignore until it happens." We quickly release how dependent on the hydro system we have become, when our power goes out for a few hours or even a day or two, following a severe weather event. Such an event is certainly 'inconvenient' but soon forgotten when the power returns. Going without power, and its trickle-down effects on our depended-upon infrastructures for several months or longer, would not be just 'inconvenient'. It would be a life-altering. The Carrington event happened during Cycle 10, on the upward climb to the peak of an average-sized cycle. 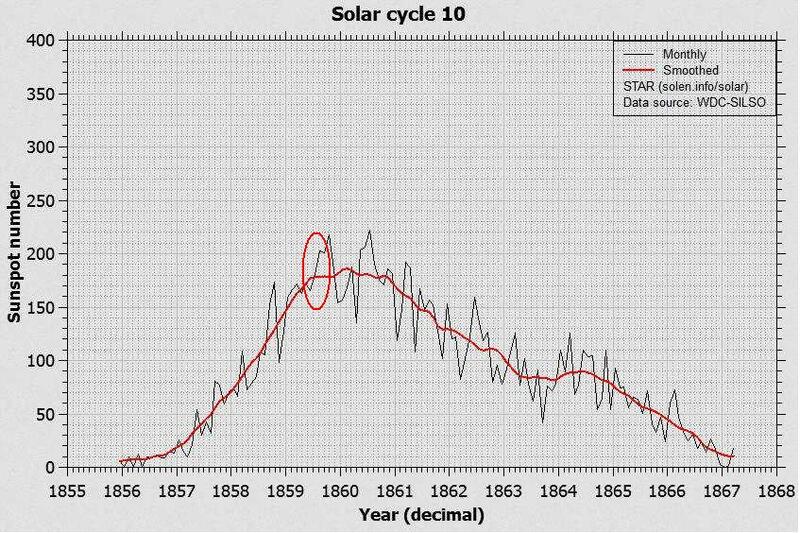 Solar scientists, for the most part, now predict a general decrease in solar activity over the next few cycles ... a spotless sun may become more the norm. Perhaps it is a good thing that the likelihood of a mega-flare event will be reduced but it seems that a repeat, at some point, is inevitable. Maybe I'd better stop wishing for flares. It seems that all of my blogspots of late have focused on 630m propagation ... but what has been happening down there recently has been both amazing and somewhat unexpected. With the growing number of active stations listening and transmitting, the band's propagation capabilities and mysteries are quickly revealing themselves. Last night was a great example but perhaps the WSPRnet prop map illustrates this best. The amount of North American activity grows each day, especially now that the DX season has arrived. At one point last night, KB5NJD reports over 100 stations either transmitting or reporting via the WSPRnet activity page! With thunderstorm activity gradually shrinking, reception should only get better over the next few months. Particularly striking was the long haul propagation from VK to North America, with northernmost VK4YB leading the pack. 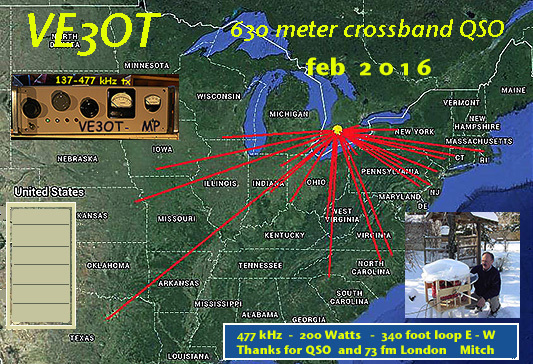 His 90 watt signal made it all the way to VE3IQB, near Ottawa as well as to NO3M, in Pennsylvania! To provide further hope to those that have little room for big receiving antennas, VE3IQB uses a typical small active e-probe antenna, 20' above ground! This spotlight propagation to the select regions of the east coast is further mystified by the level of geomagnetic activity overnight, with the K index reaching level 5 and higher! Interestingly, all of this was right over my head, with not a single peep heard here from Roger. 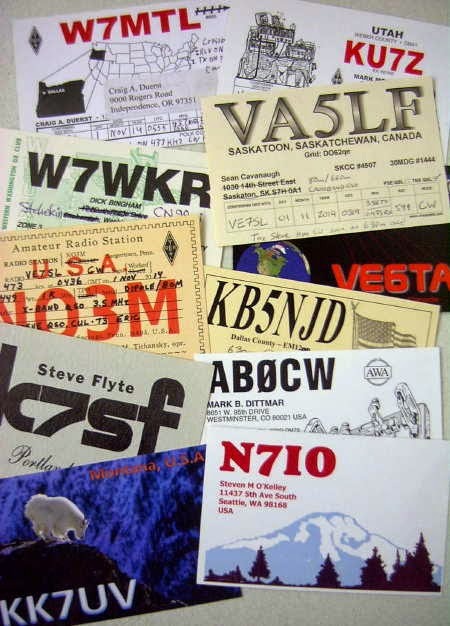 Stations across Georgia Strait, VE7BDQ, VE7CNF and VA7MM all reported hearing Roger as well as being heard by him. For the latter two, yesterday and today represent their initial decodes to down under. I'm theorizing that Roger's signal was arriving today at much lower angles than normal, evidenced by its far-reaching east coast reception and the fact that it couldn't get over my 600' local obstruction to the west. I've always believed that it takes higher angled signal arrival for me to hear Roger and today's events seem to support this. Exactly what would cause this to be the case, I'll leave to the experts but I imagine that the sudden surge in geomagnetic activity played a significant role in today's very different propagation paths. Roger was not the only VK lighting-up the map today. 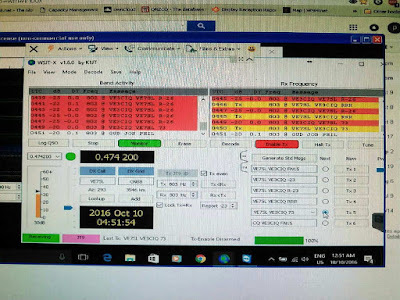 A much more detailed account of all the action can be found on the KB5NJD's daily 630m report here ... all very inspirational and hopefully enough to spur even more new activity on the MF band. Why not give a listen and see what you can hear? The 630m band continues to provide interesting challenges for Canadian amateurs ... be they antenna, equipment or propagation related. Sunday night produced another flurry of excitement on the new band, further demonstrating its potential for small stations operating from the suburbs. On Sunday evening, VE3CIQ in Carleton Place, Ontario (southwest of Ottawa), and I, completed a two-way JT9 contact, following a short exchange of the required information (and more) just after midnight, Ontario time. Noting the increased east-west favorability over the past few nights, Phil and I decided to give it a shot and were delighted to cover the 2200 mile / 3500km path while Murphy was sleeping and not messing with propagation. Rather than randomly beacon on JT9, we both set 'calling each other' messages. Although this continued for some time, the QSO only took 12 minutes to complete once I started to decode Phil's signal out west. He had been decoding me and sending signal reports for a long time before his signal eventually peaked up here for the evening. I suspect that we could have continued the contact for the remainder of the night as his signal was getting stronger and stronger as we worked. Following our QSO, Phil sent me some information about his station. 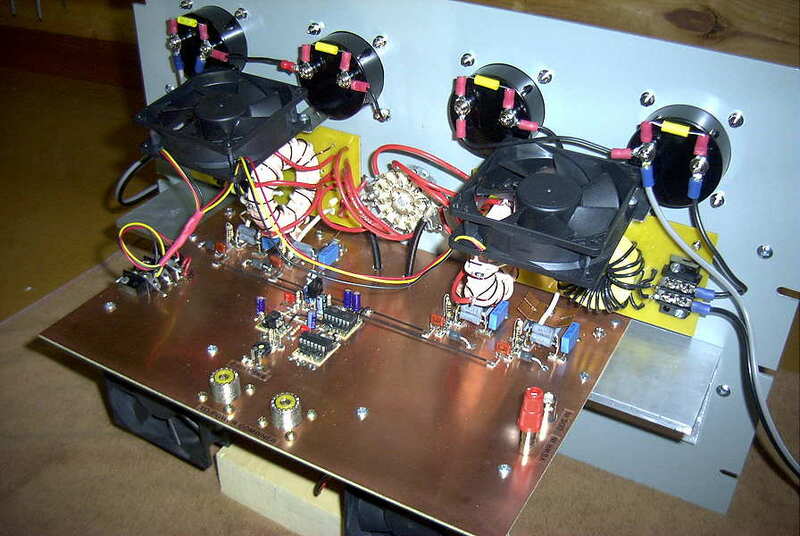 His transmitter consists of a Yaesu FT-817 driving an XKA transverter which in turn drives his homebuilt class-E amplifier. 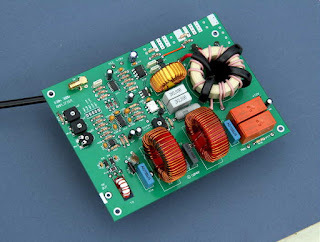 The amp consists of three switching FETs in parallel, operating at 24V and produces about 175W out. Phil's antenna is an 'inverted-L' style ... 45' up to the top of a Pine tree and then a very very long sloping top hat wire, folded back on itself three times, in a zig-zag pattern. This use of linear-loading allows him to squeeze a near full 1/4 wave antenna into his suburban lot as well as to reduce the size of his loading coil inductance. His ground system consists of ~3,000' of buried radials. 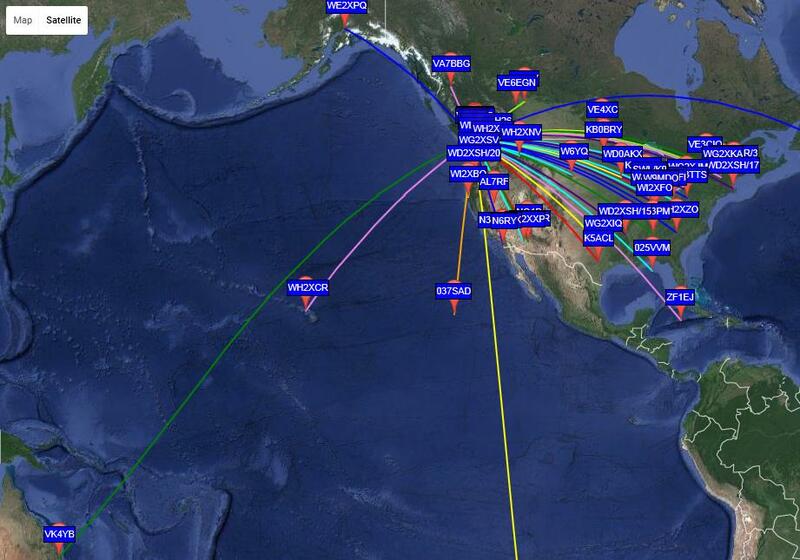 By all accounts, it seems to perform very well as his WSPR beacon was recently heard in Hawaii! Phil's station stands as yet another fine example of those living in the suburbs without a lot of room for antennas yet still able to successfully operate and explore our new 630m band. With a little ham-radio creativity, it's surprising how well a small station can perform, especially when the propagation co-operates. 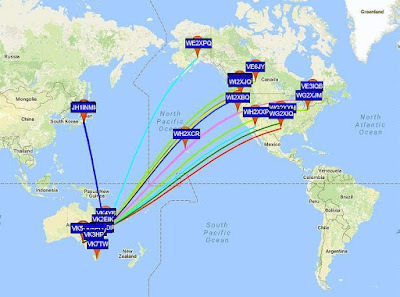 Following our contact, I moved back to the WSPR section of the band and continued beaconing overnight. Apparently Phil and I picked a good evening to run a sked as the overnight WSPR map shows it to have been the best night of the new DX season so far, with forty-four individual stations reporting my signal via the WSPRnet website. 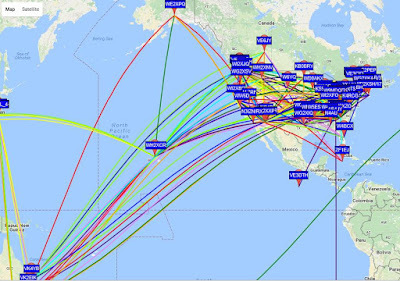 Interest and activity on 630m continues to grow nightly, now that the DX season has arrived and the reality of a 630m ham band for U.S. amateurs grows ever closer. Dave, GØRMF, long time LF proponent and ardent home-brewer has recently posted construction details of his new 630m transmitter. It is a readily reproducible design that may be of interest to those looking for a transmitter capable of developing full ERP power output. 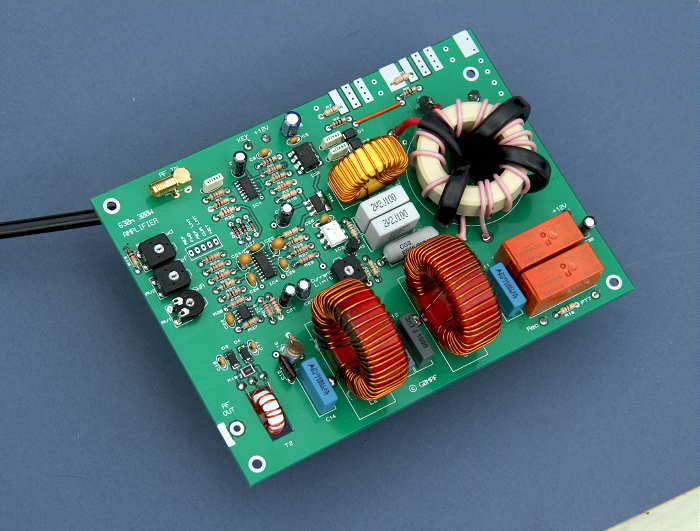 In many respects, this circuit is similar to my own homebrew transmitter which can be used on both 630 and 2200m. Although Dave has built his circuit on double-sided PCB, the project would be equally at home on one-sided board or even constructed 'Manhattan' style, the method I chose. This latter style lends itself to easy component swapping to optimize circuit performance. If you are interested in the PCB approach, Dave has made the PCB available, with the needed surface mount IC's pre-soldered to the board. In addition, he has the toroids and resistors available for purchase here. In addition, Dave's website contains several interesting circuits that might be of interest to those getting started on 630m. 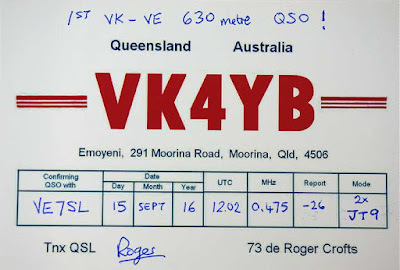 On Saturday morning, VK4YB and I had our second QSO on 630m using JT9, the WSPR QSO mode. Signals were slightly better than our initial contact but still far from previously seen conditions on the 11,000 + km Trans-Pacific path. However what happened following our contact was equally exciting. I thanked Roger for the contact, via the ON4KST LF / MF chat page and indicated I was going back to bed as it was still pre-sunrise here on the west coast. He indicated that my signal strength had increased noticeably on my last two transmissions and asked if we might try CW for a few minutes. We had previously devised our CW protocol to follow a similar one to that used in CW moonbounce work. We would transmit and receive in one minute sequences, with me transmitting on the even minutes and Roger on the odd. Instead of using the RST code for signal reporting, an 'O' is used to indicate reception strong enough to have been able to copy both calls. Both stations are required to copy the 'O', which cannot be sent until both calls have been fully copied. An acknowledgement ('R') must also be sent and copied by both stations to indicate receipt of the signal report. Once the 'R' has been copied, the final transmission(s) are a '73'. Once both stations have copied the 'R', the '73' is technically not required but when copied, further confirms the completion of a valid contact. For both of us (late at night for him and pre-dawn for me), it was a bit of a mad scramble to make a quick changeover to CW. From my end, there are a number of changes that must be made correctly to avoid over-driving the transverter and damaging the frequency doubler as well as changing to manual PTT to avoid hot-switching of the antenna relays. I also need to bring up the PC's visible clock-face with its sweep second-hand ... but we both made the transition in about two minutes. We ran for about 45 minutes during which time I heard Roger's CW on two back-to-back sequences (1331Z and 1333Z), copying both calls on each sequence. 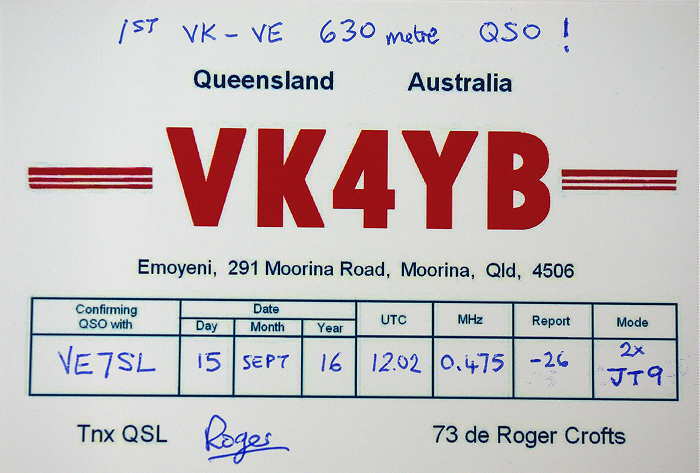 From 1331Z on, I added Roger's signal report to my calls to him ... 'VK4YB VE7SL OOO'. We stopped at my sunrise but Roger had only copied fragments of my transmission and never enough to copy both calls. It appeared that we could both have used a few more db on the path as previous estimates have indicated that we might see at least another 5 or 6db yet, on a really good morning. As well, it seemed that the TP pipeline on Saturday morning had centered itself to my south, around northern California and VE7 was on the far northern edge of the propagation path. Well it seemed that Sunday morning had moved the path further to the north and our 'extra 5-6db' was on hand. All of the local VE7's had numerous decodes of Roger's WSPR signals, including my own 20 decodes in the pre-dawn hours, but ... as 'Murphy' would have it, Roger was suffering receiver-blocking thunderstorm / lightning noise, keeping his K3's s-meter hard against the pin and absolutely no chance of a CW sked. It may have been a much more exciting morning had the spring weather near Roger been more cooperative. This morning, the weather was still restricting good reception down-under but is forecast to dissipate shortly. But Murphy has not finished with us yet, as the TP path had also noticeably deteriorated today as well. It looks as though the challenge will now be getting everything to come into perfect alignment before the summer weather in VK shuts our CW attempts down for the season. This past weekend's CLE saw noticeably improved conditions compared with the previous event. With the fall DX season fast-approaching, the combination of diminishing thunderstorm activity and improved propagation provided some interesting catches. Friday night was the best with Saturday having a brief period of favorable prop, while no new stations were heard on Sunday night, the poorest. It was particularly nice to hear strong signals from the eastern provinces on Friday, highlighted with an excellent signal from 'JT' (390 kHz) in Stephenville, Newfoundland. 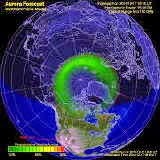 This long haul east-west propagation can only be found with quite geomagnetic conditions as was the case on Friday. After examining the geomagnetic 'K' data for Saturday (25th), it's interesting to note that the four catches for that night all coincided exactly with the brief green bar (K= 0-3) centered on the hours around 0900 UTC (circled). The results from all participants can be found at the NDB List website, or if you are a member of the ndblist Group, results have also been e-mailed and posted there. The very active Yahoo ndblist Group is a great place to learn more about the 'art' of NDB DXing or to meet other listeners in your region. There is a lot of helpful information available there and new members are always very welcome. As well, you can follow and chat with other NDB chasers regarding antennas, techniques, unidentified signals and nightly propagation.